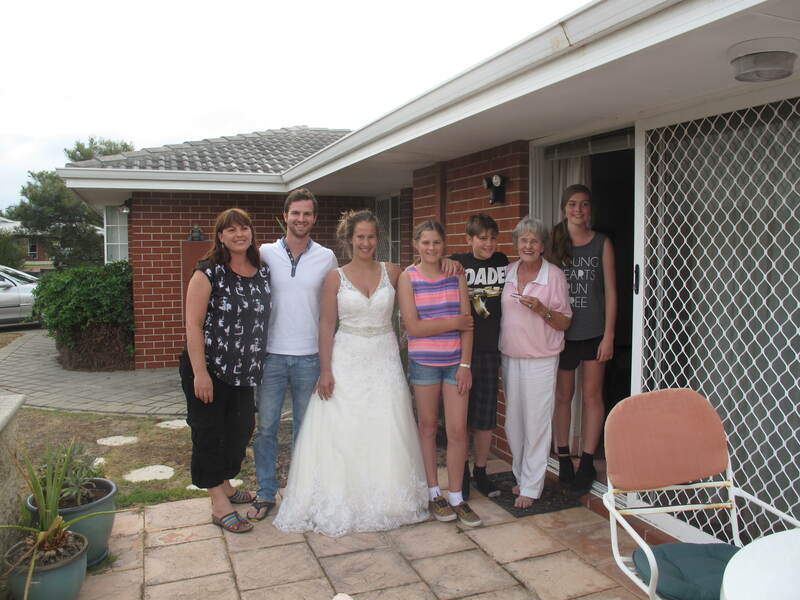 This afternoon my sister-in-law (married to my youngest brother) and their three younger children came to stay overnight at my mother’s house because they have hospital checkups up in Perth tomorrow and the next day. Neither my family or theirs was able to attend my eldest niece’s wedding in Scotland a few months ago to her Scottish beau. 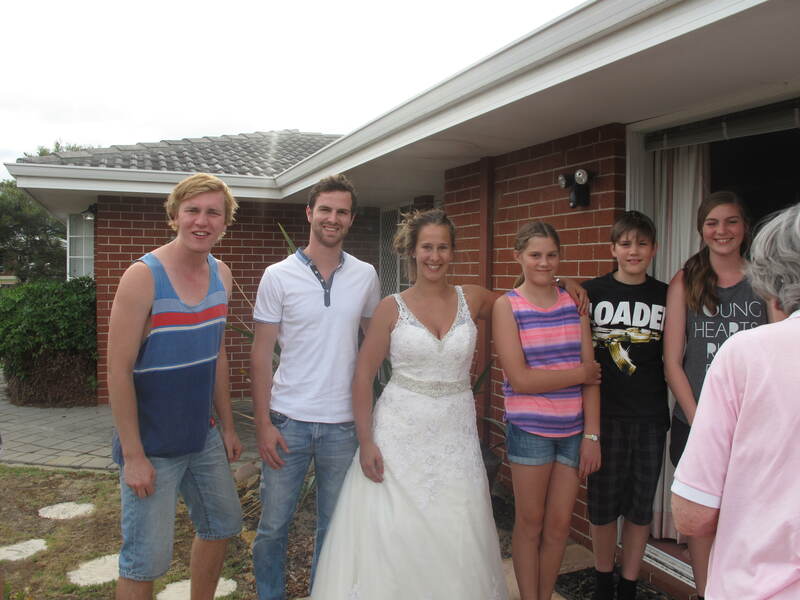 So, as a special treat for all of us, Ashtyn came over in her wedding dress! Later tonight they will watch the wedding video which Ming and I have already seen. In fact, we were the first to see it – quite an honour as we got to watch it with the happy couple, and, even though I am not usually a wedding crier, I did shed a few happy tears. It was so beautiful to see my sister-in-law, and my nieces and nephew (all of whom have nearly fully recovered from injuries sustained in the accident), and then, when Ashtyn arrived in her dress, it was such a buzz for all of us! My other brother’s daughter (Ashtyn’s younger sister) will hopefully get her spinal brace off in a couple of days. As you can imagine, we are all in a state of perpetual hope that this will happen. As a whole, our family is beginning to breathe a bit easier now. Well, Ashtyn had to take the wedding dress off and change before she could breathe at all, but that’s beside the point! Oh and my mother prepared an incredible meal for everyone of leftover pizzas from Ming’s party. Perfect! Thank you Diane – I really appreciate it. 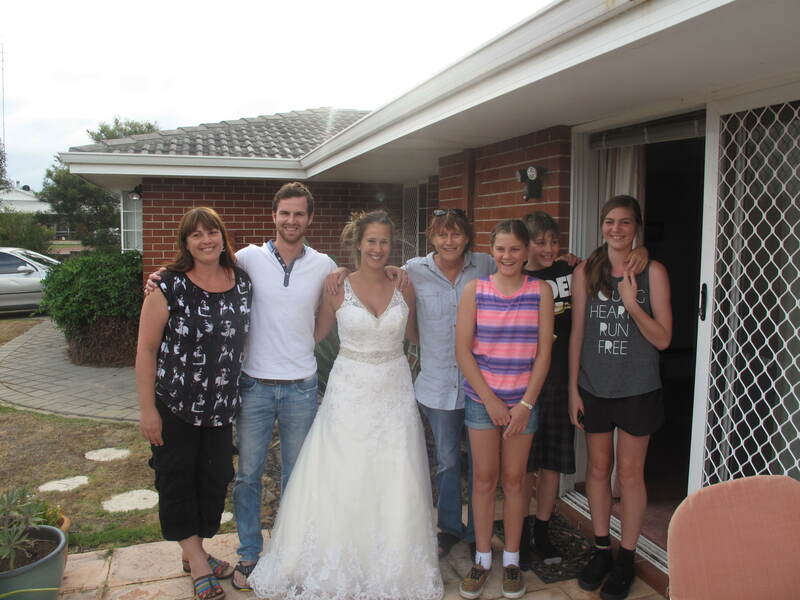 What a beautiful family Jules; and her wedding dress is gorgeous. Wishing your niece all the best for when she gets her brace removed. Sad, but I think I know your family better than mine. i will pick up the phone more often. Lovely picture, lovely bride , everyone looking good. Well we have been flung together rather a lot lately! Great for you to have company sometimes. How lovely. Beautiful couple. Beautiful family. My younger niece and nephew (twins) have only just turned 12 – look how tall they are! I hope the check ups all go off satisfactorily. It is a lovely wedding dress, and it would had been nice to see her in it. That was definitely what his look meant! It was such great watching that video the other night – felt as if we were there! Wow! That was wonderful of her to redo the wedding dress. What a great idea!!!! Glad you all had a good time and awesome photos!! !